This year I created a wild bee habitat, which I mentioned I was planning to do in my birdhouse post a few months ago. Those are chunks of wood and bamboo stuffed into an old wine box. The roof is an aluminum cooking pan that had seen better days. Plus Alzheimer's is scary. 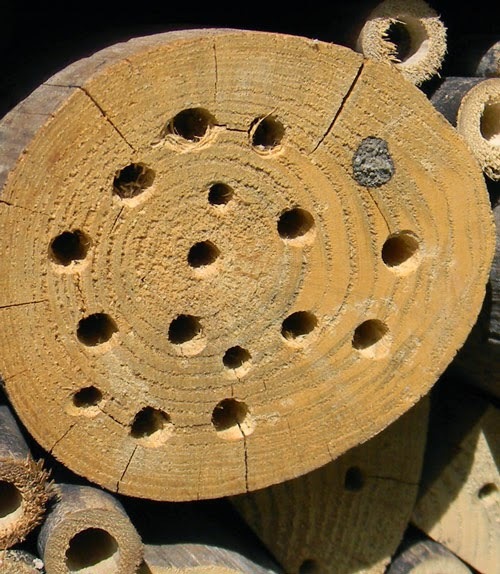 Mason bees and other solitary bees and wasps like to build nests for their babies in wood holes. Creating a solitary bee habitat is easy. I just drilled a bunch of holes in varying sizes to give them some ready-made housing. 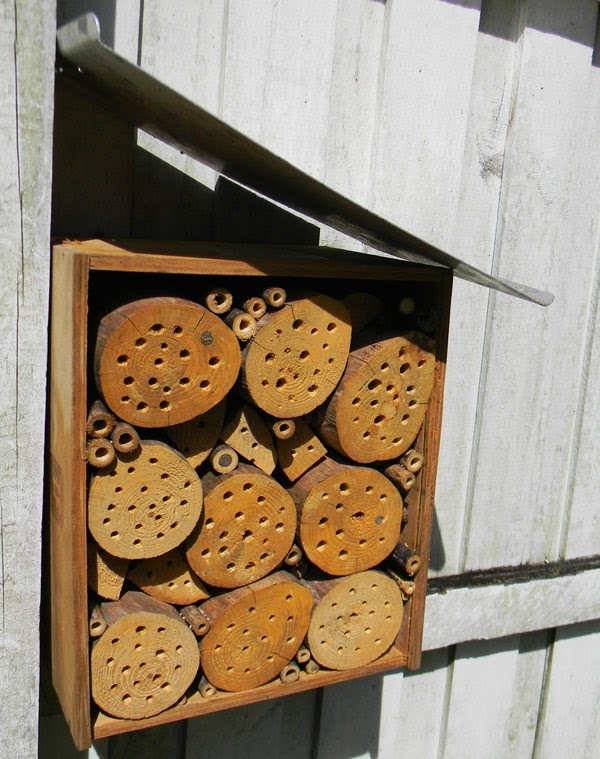 Call it an insect condo... a bee house... an insect hotel or whatever you like. It's working! Thus far I've seen a brilliant green bee on the house, multiple small solitary black and white wasps, and some mason bees. Why do I want them around? Pollination and pest control! They're hunting caterpillars and other insects as baby food and they're visiting my fruits and vegetables and scattering pollen about. We can't always count on honeybees anymore, so it's time to recruit their cousins. Since I took these photos a few days ago, there's been a lot more activity... the vacancies are filling up and there's always activity around the bee house. I'm impressed - and I'll be building plenty more to scatter around the yard next year. Very cool. It looks quite well protected from any woodpeckers, too, in case you have any of those around. Oh yes - we have two different species of woodpecker here and I've seen both in the yard. I didn't think about them... hopefully they'll stay away from my precious baby bees. I wish we could attach pictures in the comment section. Check out this bug hotel (and this isn't some spam link getting you to buy limestone facecream. . . although it might try and convince you to sell bird houses!). That's a great one. I was planning to build something elaborate but the season got away from me. Maybe next winter.